A vascular remodeling device has a plurality of sections, sized for deployment in a blood vessel, that is radially expandable from a collapsed state to an expanded state. Each section has a plurality of interconnected struts that define a waist, a proximal face, and a distal face. Each face comprises (i) a plurality of distal strut portions extending proximally from a distal side of the face, (ii) a plurality of proximal strut portions extending distally from a proximal side of the face, and (iii) a plurality of sub-struts, wherein, from each proximal strut portion, two of the sub-struts each extend to a different one of the distal strut portions. [OOOlj This application claims priority, pursuant to 35 U.S.C. § 119, to U.S. Provisional Patent Application No. 61/540,643, filed September 29, 201 1 , titled VASCULAR REMODELING DEVICE, the entire contents of which are incorporated herein by reference. Neurovascular or cerebral aneurysms affect about 5% of the population. Aneurysms may be located, for example, along arterial side walls (e.g., the aneurysm 10 illustrated in Figure 1) and at arterial bifurcations (e.g., the aneurysm 20 illustrated in Figure 2). The direction of fluid flow is generally indicated by the arrows 16, 26. The aneurysms 10, 20 each have a fundus 12, 22, a neck 14, 24, and a fundus-to-neck ratio or "neck ratio." If the neck ratio is greater than 2 to 1 or if the neck 14, 24 is less than 4 mm, the aneurysm 10, 20 may be treated with embolization coils alone because the coils will generally constrain themselves within the aneurysm 10, 20 without herniating into parent vessels. If the neck ratio is less than 2 to 1 or if the neck 14, 24 is greater than 4 mm, the aneurysms 10, 20 may be difficult to treat with embolization coils alone because the coils may be prone to herniating into parent vessels, as illustrated in Figures 3A and 3B. Herniation of coils may cause arterial occlusion, stroke, and/or death. Compared to the bifurcation illustrated in Figure 2, the efferent vessels of the bifurcation may be at substantially different angles, have substantially different sizes, and/or be a different quantity (e.g., three or more). Compared to the bifurcation illustrated in Figure 2, the aneurysm 20 of the bifurcation may be offset with respect to the junction (e.g., having a neck substantially open to one efferent vessel), tilted with respect to a plane created by the vessels (e.g., into or out of the page), etc. Each of these would still be accurately characterized as a "bifurcation" herein. In order to inhibit such herniation, tubular neck remodeling devices, for example Neuroform®, available from Boston Scientific, and Enterprise™, available from Cordis Neurovascular, may be used to keep coils or other materials within the fundus of the aneurysm and out of the vessels. Tubular remodeling devices generally consist of a braided wire or cut metallic stent or stents covering the neck of the aneurysm. As illustrated in Figure 4A, tubular remodeling devices 40 are generally useful for side wall aneurysms 10, As illustrated in Figures 4B and 4C, tubular remodeling devices 42, 44 are generally less useful for aneurysms 20 at bifurcations (e.g., the basilar tip area), for example because positioning/shaping the remodeling devices to preserve blood flow through the afferent and efferent vessels while also inhibiting herniation of coils 28 out of the aneurysm 20 can be difficult. The present disclosure includes, without limitation, the following embodiments. Various embodiments of the subject technology are described as numbered clauses (1, 2, 3, etc.) for convenience. These are provided as examples, and do not limit the subject technology or the present disclosure. It is noted that any of the dependent clauses may be combined in any combination, and placed into any independent clause. The other clauses can be presented in a similar manner. an intermediate section that couples the anchor section and the distal section. 2. The device of clause 1, wherein the number of the first proximal strut portions is equal to the number of the first distal strut portions. 3. The device of clause 1, wherein the number of the first sub-struts is double the number of the first distal strut portions. 4. The device of clause 1, wherein the number of the second proximal strut portions is equal to the number of the second distal strut portions. 5. The device of clause 1, wherein the number of the second sub-struts is double the number of the second distal strut portions. 6. The device of clause 1, wherein the second waist comprises the radially largest region of the distal section when the distal section is in its expanded state. 7. The device of clause 1, wherein each of the first sub-struts extends between a first proximal strut portion and a first distal strut portion that are angularly offset with respect to each other. 10. The device of clause I, wherein the distal face is configured to perform a therapeutic blocking function at the aneurysm, the function comprising at least one of (a) supporting maintenance of a therapeutically effective amount and/or density of at least one filling material and/or device in the aneurysm, (b) promoting thrombogenesis, and (c) diverting flow from the aneurysm. 11. The device of clause 1 , wherein the distal section is configured to prevent members of the second waist from moving substantially toward a side of the blood vessel. a distal section configured for deployment at a junction of two or more blood vessels, the distal section being radially expandable from a collapsed state to an expanded state, the distal section comprising a second waist configured to engage a wall of the junction when the distal section is in its expanded state; and an intermediate section that couples the anchor section and the distal section. 13. The device of clause 12, wherein the number of the proximal strut portions is equal to the number of the waist struts. 14. The device of clause 12, wherein the number of the first sub-struts is double the number of the waist struts. 15. The device of clause 12, wherein the number of the waist struts is equal to the number of the distal strut portions. 16. The device of clause 12, wherein the number of the second sub-struts is double the number of the distal strut portions. 17. The device of clause 12, wherein the first waist comprises the radially largest region of the distal section when the distal section is in its expanded state. 18. The device of clause 12, wherein each of the first sub-struts extends between a proximal strut portion and a waist strut that are angularly offset with respect to the longitudinal axis. 19. The device of clause 12, wherein each of the second sub-struts extends between a waist strut and a distal strut portion that are angularly offset with respect to the longitudinal axis. 20. The device of clause 12, wherein the distal section is configured to prevent members of the first waist from moving substantially toward a side of the blood vessel. 21. The device of clause 12, wherein each of the waist struts comprises: (i) a first distal strut portion extending proximally from the first waist and (ii) a second proximal strut portion extending distally from the first waist. an intermediate section between each longitudinally adjacent pair of the sections. 23. The device of clause 22, wherein the intermediate section maintains a substantially constant radial dimension in both the collapsed state and the expanded state. 24. The device of clause 22, wherein each of the first sub-struts extends between a proximal strut portion and a waist strut that are angularly offset with respect to each other. 25. The device of clause 22, wherein each of the second sub-struts extends between a waist strut and a distal strut portion that are angularly offset with respect to each other. 26. The device of clause 22, further comprising a wire tethered to a proximalmost one of the sections. For purposes of summarizing the invention and the advantages that may be achieved over the prior art, certain objects and advantages of the invention are described herein. Of course, it is to be understood that not necessarily all such objects or advantages need to be achieved in accordance with any particular embodiment. Thus, for example, those skilled in the ait will recognize that the invention may be embodied or carried out in a manner that achieves or optimizes one advantage or group of advantages as taught or suggested herein without necessarily achieving other objects or advantages as may be taught or suggested herein. [0007J Figure 1 illustrates an example embodiment of a side wall aneurysm. Figure 2 illustrates an example embodiment of a bifurcation having an aneurysm. Figure 3A illustrates an example embodiment of a side wall aneurysm with herniating embolization coils. Figure 3B illustrates an example embodiment of a bifurcation having an aneurysm with herniating embolization coils. Figure 4A illustrates an example embodiment of a side wall aneurysm treated with embolization coils and a tubular remodeling device. Figures 4B and 4C illustrates example embodiments of a bifurcation having an aneurysm treated with embolization coils and tubular remodeling devices. Figure 5 illustrates an example embodiment of a vascular remodeling device. Figure 6 illustrates a partial end view of the device of Figure 5, taken along the direction indicated by the arrows 6-6 in Figure 5. Figure 7 illustrates a partial end view of the device of Figure 5, taken along the direction indicated by the arrows 7-7 in Figure 5. Figure 8 illustrates the device of Figure 5 in an example of a use environment in a vascular bifurcation with an aneurysm. Figure 9 illustrates the device of Figure 5 in an example of a use environment in a vascular bifurcation with an aneurysm and an angled or curving parent vessel. Figure 10 illustrates a variation of the device of Figure 5, in which a proximal section of the device forms an extended waist portion. Figure 11 illustrates the device of Figure 10 in an example of a use environment in a vascular bifurcation with an aneurysm. Figure 12 illustrates an example configuration of a widened portion for use on struts of the device of Figure 5 or the device of Figure 10. Figure 13 illustrates a cut pattern for use in making a device similar to the device of Figure 5, but with six struts in the distal section thereof. Figure 14 is a detail view illustrating the distal section and part of the proximal section of the cut pattern of Figure 13. Figure 15 is a detail view illustrating a proximal end portion of the cut pattern of Figure 13. Figure 17 is a detail view illustrating the distal section and part of the proximal section of the cut pattern of Figure 16. Figure 18 is a detail view illustrating a proximal end portion of the cut pattern of Figure 16. Figure 19 illustrates part of a method of inserting a vascular remodeling device into a vascular bifurcation having an aneurysm, and/or of treating the aneurysm. Figure 20 illustrates another part of the method of Figure 19. Figure 21 illustrates another part of the method of Figures 19-20. Figure 22 illustrates part of a method of placing filling material in an aneurysm located near a bifurcation having a remodeling device therein. Figure 23 illustrates another part of the method of Figure 22. Figure 24 illustrates another part of the method of Figures 22-23. Figure 25 illustrates a cut pattern for use in making another embodiment of the device. Figure 26 illustrates a detail view of a proximal section of the cut pattern of Figure 25. Figures 27 illustrates a detail view of a distal section of the cut pattern of Figure 25. Figure 28 illustrates a device made with the cut pattern of Figures 25-27, in an expanded state. Figure 29 illustrates a detail view of the proximal section of the device of Figure 28. Figure 30 illustrates a proximal end view of the proximal section of the device of Figure 28. Figure 31 illustrates a detail view of the distal section of the device of Figure 28. Figure 32 illustrates a distal end view of the distal section of the device of Figure 28. Figure 33 illustrates a cut pattern for use in making another embodiment of the device. Figure 34 illustrates a detail view of a distal section of the cut pattern of Figure 33. Figure 35 illustrates a distal section and part of a proximal section of a device made with the cut pattern of Figures 33-34, in an expanded state. Figure 36 illustrates a distal section and part of a proximal section of the device of Figure 35. Figure 37 illustrates a distal end view of the device of Figures 35-36. Although certain embodiments and examples are described below, it should be appreciated that this disclosure extends beyond the specifically disclosed embodiments and/or uses and obvious modifications and equivalents thereof. Thus, it is intended that the scope of this disclosure should not be limited by any particular embodiments described below. Figures 5-7 illustrate an example embodiment of a vascular remodeling device 50. It will be appreciated that the device 50 may be more compliant than the vasculature in which it is deployed such that it may be somewhat misshapen after being deployed, and that certain shapes described herein are when the device 50 is an expanded (e.g., further expanded) state with no restriction. The device 50 comprises a proximal section 52 (or "bottom section" or "proximal portion" or "anchor portion"), an intermediate section 54 (or "middle section" or "junction" or "pivot junction"), and a distal section 56 (or "top section" or "distal portion"). The device 50 can be delivered via a catheter (e.g., microcatheter) into a bifurcation to support an aneurysm filling device with minimal interruption of blood flow in afferent and efferent vessels. In some embodiments, the device 50 may be retrieved and/or repositioned. The proximal section 52 can be radially self-expanding and comprise a plurality of radially self-expanding struts 58. Six struts 58 are depicted in the proximal section 52 of Figures 5-6 (and only four of the struts 58 are visible in Figure 5), but more or fewer struts may be employed in the proximal section 52, as described in further detail herein. The struts 58 converge toward the radial center of the proximal section 52 at the distal end of the proximal section 52, where the proximal section joins the proximal end of the intermediate section 54, and at the proximal end of the proximal section 52, where the proximal section joins a proximal end portion 60 of the device 50. The proximal end portion 60, located at the proximal end of the device 50, may comprise a simple interconnection of the proximal ends of the struts 58, or it may comprise a coupling to facilitate delivery and/or re-sheathability and re-positionability of the device 50. Such a coupling may comprise an electolytic, mechanical, chemical and/or instant detachment mechanism, configured to connect the device 50 to a delivery member such as a pusher wire. When the device 50 is in the expanded configuration shown in Figures 5- 7, the proximal struts 58 extend radially outward as they advance from the proximal and distal ends of the proximal section 52, thereby fomiing proximal and distal tapering portions or faces 62, 64 of the proximal section 52. The struts 58 reach their radially outermost extent in a waist portion 66 of the proximal section 52, between the proximal and distal faces 62, 64. When the device 50 is deployed in a patient's vasculature, the waist 66 may engage a vessel wall to hold the proximal section 52 and device 50 in place as desired. (Depending on the shape or orientation of the vessel, bifurcation, etc., other portions of the proximal section 52 may engage the vessel wall in addition to or instead of the waist 66.) In the depicted waist portion 66, the struts 58 are curved and form curving radial crests or peaks. Alternatively, in the waist 66 the stmts 58 can be flat and generally straight and parallel, to form an elongate and/or cylindrical waist 66. The struts 58 of the proximal section 52 can have a substantially rectangular or flat cross section (e.g., where the struts 58 comprise uncut portions of a metallic tube or sheet). The struts 58 can alternatively have a substantially round (e.g., circular, elliptical, ovoid) cross section (e.g., where the struts 58 comprise round filaments). The proximal section 52 can comprise two or more struts 58, or between two and twelve stmts 58. Although the proximal section 52 depicted in Figures 5-7 comprises six struts 58, the proximal section can alternatively comprise two, three, four, five, seven, eight, nine, ten, eleven or twelve struts 58. Still other numbers of struts are possible. As seen in Figure 6, the proximal struts 58 may be equally angularly spaced and/or oriented around the central longitudinal axis of the device 50 (e.g., six struts 60° apart from each adjacent strut as shown in Figure 6, two struts 180° apart from each other, three struts 120° apart, four struts 90° apart, etc.). Although the arrangement of the struts are shown in the figures as substantially isometric, the arrangement can place the struts in various angles relative to each other (e.g., six struts varying about 20°, about 40°, about 50°, about 70°, and about 80° apart from each adjacent strut). When the device 50 is placed at a bifurcation, the proximal section allows flow to efferent vessels because the stmts 58 do not block fluid flow. The tapered proximal face 62 of the proximal section 52 may allow the device 50 or portions thereof (e.g., the proximal section 52) to be retrieved back (e.g., in the proximal direction) into a delivery catheter via a distal opening thereof. For example, if the device 50 is being pulled into a catheter, the tapered proximal face 62 may radially compress the proximal section 52. The ability to retrieve the device 50 or proximal section 52 facilitates removal or re-positioning of the device 50 if an initial placement is not satisfactory. The distal section 56 can be radially self-expanding and comprise a plurality of radially self-expanding stmts 68. Eight struts 68 are depicted in the distal section 56 of Figures 5 and 7 (and only five of the stmts 68 are visible in Figure 5), but more or fewer stmts may be employed in the distal section 56, as will be described in further detail below. The struts 68 converge toward the radial center of the distal section 56 at the proximal end of the distal section 56, where the distal section joins the distal end of the intermediate section 54, and at the distal end of the distal section 56, where the distal section joins a distal end portion 70 of the device 50. When the device 50 is in the expanded configuration shown in Figures 5- 7, the distal stmts 68 extend radially outward as they advance from the proximal and distal ends of the distal section 56, thereby forming proximal and distal tapering portions or faces 72, 74 of the distal section 56. The stmts 68 reach their radially outermost extent in a waist portion 76 of the distal section 56, between the proximal and distal faces 72, 74. When the device 50 is deployed in a patient's vasculature, the waist 76 may engage a vessel wall to hold the distal section 56 and device 50 in place as desired. (Depending on the shape or orientation of the vessel, bifurcation, etc., other portions of the distal section 56 may engage the vessel wall in addition to or instead of the waist 76.) In the depicted waist portion 76, the struts 68 are curved and form curving radial crests or peaks. Alternatively, in the waist 76 the struts 68 can be flat and generally straight and parallel, to form an elongate and/or cylindrical waist 76. One or more of the struts 68 of the distal section 56 can optionally include or form widened portions or leaves 78 on the distal face 74 of the distal section. As best seen in Figure 7, the widened portions 78 can provide a blocking function to prevent or reduce the passage of materials or fluids through the distal face 74. For example, in one aspect, the widened portions may be wider than a width of the struts forming the proximal face of the distal section. In another aspect, the widened portions may comprise a first and second ramp, where the first ramp extends from an edge of the strut to an edge of the widened portion, and the second ramp extends from the edge of the widened portion to the edge of the strut. In this manner, the widened portions 78 can help support aneurysm filling materials or devices (such as coils or embolic materials) within an aneurysm, and/or reduce or block fluid flow through the distal face 74 to promote thrombogenicity and increase the occlusiveness of the distal face. Instead of or in addition to the widened portion(s) 78, a mesh, membrane or other covering may be employed on the distal face 74 to perform similar function(s). Notwithstanding the presence of the widened portion(s) 78, mesh, membrane or other covering, the distal face 74 can include sufficient open space to allow a microcatheter or other similar device to pass through, to place coils or other aneurysm filling materials or devices in an aneurysm covered by the distal face 74. The distal section 56 can therefore allow for safe and controlled placement of coils, and can be designed to support a certain packing density of coil. If desired, the widened portion(s) 78, mesh, membrane or other covering can block fluid and material passage through the distal face 74 of the distal section 56 to a degree sufficient to provide a flow diversion effect, and serve as a flow diverter, which may allow omission of any coils or other aneurysm filling materials or devices. The struts 68 of the distal section 56 can have a substantially rectangular or flat cross section (e.g., where the struts 68 comprise uncut portions of a metallic tube or sheet). The struts 68 can alternatively have a substantially round (e.g., circular, elliptical, ovoid) cross section (e.g., where the struts 68 comprise round filaments). A circular, elliptical or ovoid cross-section may be imparted to otherwise square or rectangular struts 58/68 by processing steps such as electropolishing. The distal section can comprise two or more struts 68, or between two and twelve struts 68. Although the distal section 56 depicted in Figures 5-7 comprises eight struts 68, the distal section can alternatively comprise two, three, four, five, six, seven, nine, ten, eleven or twelve struts 68. Still other numbers of struts are possible. As seen in Figure 7, the distal struts 68 may be equally angularly spaced and/or oriented around the central longitudinal axis of the device 50 (e.g., eight struts 45° apart from each adjacent strut as shown in Figure 6, two struts 180° apart from each other, three struts 120° apart, four struts 90° apart, etc.). When the device 50 is placed at a bifurcation, the proximal face 72 of the distal section 56 allows flow to efferent vessels because the struts 68 of the proximal face 72 do not block fluid flow. The tapered proximal face 72 of the distal section 56 may allow the device 50 or portions thereof (e.g., the distal section 56) to be retrieved back (e.g., in the proximal direction) into a delivery catheter via a distal opening thereof. For example, if the device 50 is being pulled into a catheter, the tapered proximal face 72 may radially compress the distal section 56. The ability to retrieve the device 50 or distal section 56 facilitates removal or repositioning of the device 50 if an initial placement is not satisfactory. One or both of the proximal and distal sections 52, 56 can optionally be generally spherical in shape when in the expanded or deployed state. The intermediate section 54 connects the proximal section 52 and the distal section 56, and can be relatively short and relatively narrow (relative to the length and width of the proximal and distal sections 52, 56 when they are expanded). The intermediate section 54 can be located in a radially central region of the device 50, and can be confined to that radially central region (e.g., the device 50 can lack any interconnection between the proximal and distal sections 52, 56 radially outward of the intermediate section 54). So configured, the intermediate section 54 allows the distal section 56 to pivot with respect to the proximal section and thereby allow the device 50 to be deployed in tortuous vasculature. The intermediate section 54 may permit "multiaxial" pivoting or tilting, e.g. at least about a first axis through the intermediate section 54 and orthogonal to the plane of the page in Figures 5 and 8-9, and about a second axis through the intermediate section 54 and orthogonal to the first axis. The intermediate section 54 may permit "omniaxial" pivoting or tilting, about the first and second axes described above, and any radially-oriented axis passing through the intermediate section 54. The intermediate section 54 may comprise a relatively short uncut tube defining a generally tubular outer surface and the proximal and distal struts 58, 68 can comprise proximal and distal extensions of the intermediate section 54 and its tubular outer surface, and be integral and monolithic with the intermediate section 54 and its outer surface. The struts 58, 68 can extend radially outward as they extend proximally (proximal struts 58) and distally (distal struts 68) from the proximal and distal ends, respectively, of the intermediate portion 54. The proximal struts 58 and/or the distal struts 68 can be co- cylindrical with the intermediate portion 54 where they join the intermediate portion 54 at its proximal and distal ends, respectively. Where they join the intermediate portion 54, the proximal struts 58 and/or the distal struts 68 can be wider (in the circumferential direction with respect to the tubular form of the intermediate portion) than they are thick, and of similar thickness as the sidewall of the intermediate portion 54, as disclosed further herein. For example, the struts can have width of about 0.003-0.006 inches and thickness of about 0.001-0.004 inches. By providing proper thickness to width ratio, the struts may achieve adequate wall apposition while applying adequate forces against vessel walls. The device 50 may provide multiaxial or omniaxial pivoting or tilting up to relatively high deflection angles (e.g., up to 90 degrees) without significantly affecting the ability of the proximal and distal sections 52, 56 to maintain their expanded states and engage the adjacent portions of the bifurcation 25 (see Figures 8, 9). This capability can be facilitated by making the proximal struts 58 independent of the distal struts 68, e.g. as depicted in Figures 5, 8-11, 13 and 16. The two groups of struts are independent of each other in that forces acting solely on, and/or deflections occurring solely in, the proximal struts 58 do not significantly affect the ability of the distal struts 68 to maintain their 4- expanded state and/or maintain engagement with adjacent portions of the bifurcation 25, and forces acting solely on, and/or deflections occurring solely in, the distal struts 68 do not significantly affect the ability of the proximal struts 58 to maintain their expanded state and/or maintain engagement with adjacent portions of the bifurcation 25. One, some or all of the struts 58 can bend or pivot with respect to the intermediate section 54 independently of one, some or all of the struts 68, and vice versa. The intermediate section 54 may promote independence by interconnecting the struts 58 and the struts 68 in a radially central region of the device 50, and physically and functionally separating them, absorbing bending stresses from the struts 58 and the struts 68 rather than transmitting them from the struts 58 to the struts 68 or vice versa. Instead of or in addition to independence of the proximal struts 58 as a group, from the distal struts 68 as a group, the struts 58 may be independent of each other (within the group of struts 58), and/or the struts 68 may be independent of each other (within the group of struts 68). In the device 50 as depicted in Figures 5-9, the proximal struts 58 are independent of each other and the distal struts 68 are independent of each other. Each proximal strut 58 can bend or pivot with respect to the intermediate section 54 independently of the other proximal struts 58, and each distal strut 68 can bend or pivot with respect to the intermediate section 54 independently of the other distal struts 68. Independence is promoted within each group of struts 58, 68 by interconnecting them only at their proximal and distal ends, and in a radially central region of the device 50. It should be noted, however, that independence as used herein does not exclude interconnecting independent components by members (e.g. membranes, very fine wires and the like) that are insufficiently rigid to cause one component to significantly affect the action of the other. The proximal struts 58 and/or the distal struts 68 can also be independent of each other, but only within a limited region of the proximal section 52 and/or distal section 58. For example, the proximal struts 58 may be independent of each other within the distal face 64 of the proximal section, and/or the distal struts 68 may be independent of each other within the proximal face 72 of the distal section 56. The tapered distal face 64 of the proximal section 52 and tapered proximal face 72 of the distal section 56 also allow the sections 52, 56 to pivot significantly without contact between the sections 52, 56 other than at the intermediate section 54. The intermediate section 54 can be rigid or flexible. Where the intermediate section 54 is rigid, the pivotability of the device 50 can be provided by the flexibility and/or independence of the struts 58 in the distal face 64 of the proximal section 52 and of the struts 68 in the proximal face 72 of the distal section 56. In this example, the proximal and distal sections are able to pivot multiaxially relative to each other without requiring plastic deformation of the intermediate section. Each of struts 58 and struts 68 may be capable of flexing, extending, bowing, straightening, bending, or other elastic or plastic deformation along the length or a portion thereof. As struts 58 and struts 68 independently flex and extend, sections 52, 56 can pivot about intermediate section 54 and relative to each other. For example, struts on one side of a section may flex (e.g., bend), and struts on an opposing side of a section may extend (e.g., straighten), whereby the section pivots about the region where the struts connect to intermediate section 54. According to embodiments, such action is facilitated along one or more sections of the device. According to embodiments, this pivot action is provided without requiring plastic deformation of intermediate section 54 or any action along the length of intermediate section 54. The intermediate section 54 can comprise a short length of hypotube (e.g., a short length of uncut hypotube when the proximal and/or distal sections 52, 56 are cut from the hypotube) which may be flexible or rigid. According to embodiments, the intermediate section 54 can comprise a flexible coil, longitudinally oriented such that its winds spiral around the central longitudinal axis of the device 50, or the intermediate section 54 can comprise a ball-and-socket joint, a length of flexible wire, or other flexible member. The device 50 can further comprise one or more radiopaque markers (e.g. coils) coupled to or wound around portions of the device. For example, the device 50 can include radiopaque markers on one, two or all three of the proximal end portion 60, intermediate section 54, and distal end portion 70. Instead of or in addition to those markers, the device 50 can include radiopaque markers on one or more of the stmts 58, and/or on one or more of the struts 68. According to embodiments, when any of the proximal end portion 60, intermediate section 54, or distal end portion 70 defines a central lumen therethrough (e.g., when the device 50 is cut or etched from a tube or sheet), radiopaque material may be placed within some, one or all of those lumens to make the portion(s) 60/54/70 radiopaque. For example, radiopaque material maybe provided within a lumen of at least one of portion(s) 60/54/70 with securement at one or both of the ends of the lumen. The device 50 can comprise a self-expanding, super elastic, and/or a shape-memory material (e.g., comprising Nitinol, CoCr alloy, shape memory polymers (e.g., polyglycolic acid, polylactic acid), etc. ), thereby causing the device 50 to be self-expanding under certain conditions (e.g., when not restrained by a catheter). In some embodiments, the proximal section 52, the intermediate section 54, and or the distal section 56 may comprise different materials. For example, the distal section 56 may comprise polymer material while the proximal section 52 and the intermediate section 54 comprise metallic material, a different polymer material, etc. For another example, the distal section 56 may comprise metallic material while the proximal section 52 and the intermediate section 54 comprise different metallic materials, polymer material, etc. Other combinations of materials are also possible. The device 50 can assume a low profile compressed state (e.g., confined within a catheter) for delivery. When cut from a tube or sheet, the device 50 may assume substantially the diameter of the tube or rolled sheet when in the compressed state. Upon deployment from the catheter, the device 50 expands from the compressed state to an expanded state. Figure 8 depicts one example of the device 50 in use, positioned at a junction 36 of a bifurcation 25 (e.g., a neurovascular bifurcation (e.g., the basilar tip area)) comprising at least one afferent or parent vessel 30, efferent or branch vessels 32, 34, the junction 36 of the vessels 30, 32, 34, and an aneurysm 20 having a fundus 22 and a neck 24. The proximal section 52 is positioned in the parent vessel 30 in an expanded state, such that the waist 66 contacts the inner wall of the vessel 30. Where the proximal section 52 is self- expanding, the struts 58 are biased radially outward and the struts in the waist 66 may engage or "grip" the vessel wall, thereby anchoring the proximal section 52 and the device 50 in the parent vessel 30. The distal section 56 is positioned in the junction 36 in an expanded state, such that the waist 76 contacts the inner wall of the junction 36. Where the distal section 56 is self-expanding, the struts 68 are biased radially outward and the struts in the waist 76 may engage or "grip" the junction wall, thereby anchoring the distal section 56 and the device 50 in the junction 36. The struts 68 of the distal section 56 may also center the distal section 56 (and the distal face 74 thereof) in the junction 36 and/or aneurysm neck 24. When the proximal and distal sections 52, 56 are in their expanded state, the friction force developed between the proximal section 52 and the inner wall of the parent vessel 30, and/or the friction force developed between the distal section 56 and the inner wall of the junction 36, may suffice to prevent the device 50 from moving significantly in the proximal direction, away from the aneurysm 20 and in the distal direction, toward the aneurysm 20. In the implementation depicted in Figure 8, the distal face 74 of the distal section 56 extends into and occupies at least a portion of the neck 24 of the aneurysm 20. The struts 68 and widened portion(s) 78 (or another structure, such as a mesh or membrane) make the distal face 74 sufficiently low in porosity that the face 74 and device 50 can act as a scaffolding to inhibit or prevent herniation or prolapse of objects (e.g., embolization coils or materials, thrombi, etc.) out of the neck 24 of the aneurysm 20. The device 50 can permit blood to flow from the parent vessel 30 to the efferent vessels 32, 34 of the bifurcation. The proximal section 52 presents minimal axially- facing or proximally-facing surface area (see Figure 6) toward oncoming blood flow in the parent vessel 30 so that blood passes through the proximal section 52 with little or no blockage. The proximal face 72 of the distal section 56 likewise presents minimal axially- facing or proximally-facing surface area toward blood flow that has passed through the proximal section 52, so that such blood passes into or through the distal section 56 with little or no blockage. In addition, depending on the manner in which the device 50 is positioned in the bifurcation 25, blood that has passed through the proximal section 52 may flow around the distal section 56 and into one or both efferent vessels 32, 34 (indicated by arrow 80 in Figure 8), instead of or in addition to blood that flows through the distal section 56 and into the vessel(s) 32, 34. The depicted distal face 74 of the distal section 56 is configured to impede or block blood flow therethrough, via the widened portions 78 and/or other structures as disclosed elsewhere herein. Accordingly, blood tends to stagnate in and around the distal face 74, promoting thrombogenesis, occlusion of the aneurysm 20, and retention of any filling materials and thrombi in the aneurysm. Figure 9 depicts another example of the device 50 in use, positioned at a junction of a bifurcation 25 which is similar to that depicted in Figure 8, with the exception that the parent vessel 30 is significantly angled or curved with respect to the efferent vessels 32, 34, the junction 36, and/or the aneurysm 22. For example, in such a bifurcation the central axis of the parent vessel 30 can be non-coaxial and non-parallel with a central axis of the junction 36 and/or a central axis of the aneurysm 20. As depicted in Figure 9, the various components of the device 50 perform the same functions in the same manner as described with regard to Figure 8, except that the proximal and distal portions 52, 56 are not coaxial, but are in a tilted orientation (e.g., their respective central axes form an included angle of less than 180 degrees). In addition, one, two or all three of (a) the intermediate portion 54, (b) the struts 58 of the distal face 64 of the proximal portion 52, and (c) the struts 68 of the proximal face 72 of the distal portion 56, may flex or pivot to accommodate the tilted orientation of the portions 52, 56 with respect to each other, in this manner, despite the tortuosity of the bifurcation 25, the proximal portion 52 can engage the parent vessel 30 and support the distal portion 56 in the junction 36 and neck 24 sufficiently to prevent significant migration of the device 50 in the distal or proximal directions, and the distal portion 56 can be approximately centered within the junction 36 and neck 24 (and, where appropriately configured, can engage the inner wall of the junction 36 to provide additional anti-migratory support). To facilitate tilting/flexing/pivoting in the manner depicted in Figure 9, the connections of the struts 58 and/or the struts 68 to the intermediate portion 54 may be configured to provide pivoting action, such as by making the stmts 58/68 slightly thinner where they meet or connect to the intermediate portion 54. Such a pivotable arrangement of the struts and intermediate portion may allow the portions 52 and 56 to tilt with respect to each other without significantly buckling or deforming the struts and altering the expanded shape of the portions 52, 56. In other words, the pivoting connections of the struts 58/68 to the intermediate portion (instead of, or in addition to, a flexible intermediate portion 54) can relieve some or all of the bending stress imparted to the struts 58/68 when the device 50 takes on a tilted orientation as in Figure 9. These structural features may be employed instead of or in addition to others disclosed herein to promote pivoting/tilting the sections 52, 56 without substantially affecting their ability to remain expanded or engage adjacent portions of the bifurcation. The device 50 may be configured to allow the portions 52, 56 to tilt/flex/pivot with respect to each other up to 90 degrees. Figures 10-11 depict another example of the device 50, which can be similar in structure, function, methods of use and construction, etc. to the device 50 described herein with reference to Figures 5-9, except as further described herein. Accordingly, like reference numerals refer to like components in Figures 5-9, on the one hand, and Figures 10- 11 on the other hand, except where a description or depiction to the contrary is provided expressly herein. In the device 50 of Figures 10-11, the waist 66 comprises a number of waist members 67 that interconnect both laterally (e.g., circumferentially) and longitudinally. The waist members 67 can thus form a number of bands of diamond forms 69 which are expandable in circumference to engage or grip the inner wall of the parent vessel 30 when the device 50 is in use. The waist members 67 can be arranged in circumferentially expandable patterns other than the one depicted in Figures 10-11, with or without the use of diamond forms 69. The struts 58, and the proximal and distal faces 62, 64 of the proximal section 52, can be similar to those described herein with reference to the device 50 of Figures 5-9. In the device 50 of Figures 10-11 the proximal face 62 of the proximal section 52 and the proximal end portion 60 may be omitted altogether, to create a device 50 with an open proximal end. In a variation of the device 50 of Figures 5-9, or of the device 50 of Figures 10-11, the waist 66 can comprise an expandable woven mesh, woven from filaments of any material disclosed herein as suitable for constructing the device 50. Such a woven mesh can be cylindrical in form, with the distal edge thereof connected to the proximal ends of the struts 58 of the distal face 64 of the proximal portion 52. The proximal edge of the cylindrical mesh can be connected to the distal ends of the struts 58 of the proximal face 62 of the proximal portion 52. According to embodiments, the proximal face 62 of the proximal section 52 and the proximal end portion 60 may be omitted altogether, to create a device 50 with an open proximal end. Figure 11 depicts one example of the device 50 of Figures 10-11 in use, positioned at a junction 36 of a bifurcation 25 in a manner similar to that depicted in Figure 8. The proximal section 52 is positioned in the parent vessel 30 in an expanded state, such that the waist 66 contacts the inner wall of the vessel 30. Where the proximal section 52 is self-expanding, the struts 58 are biased radially outward and the waist member 67 and diamond forms 69 are biased to a circumferentially expanded state so that the waist 66 engages or "grips" the vessel wall, thereby anchoring the proximal section 52 and the device 50 in the parent vessel 30. Furthermore, the functions, modes of action, and methods of use of these and the other components of the device 50 of Figures 10-11 are the same as described elsewhere herein (including in connection with Figures 8-9) for the device 50 of Figures 5-9. Figure 12 depicts one example of a widened portion 78 that may be employed with any of the embodiments of the device 50 disclosed herein. One, some or all of the widened portions 78 (and struts 68) of the device 50 may take the form depicted in Figure 12 and further described herein. To form the widened portion 78, the strut 68 can be longitudinally split into sub-struts 82 that surround an opening 84 in the widened portion 78. The opening 84 can be left as an open space, in which case the thrombogenicity of the distal face 74 of the distal section 56 is enhanced by the division of the struts 68 of the distal face into a larger number of narrower, spread-apart sub-struts 82. According to embodiments, the opening 84 can be filled or covered with radiopaque material, and/or radiopaque coils can be wound around the sub-struts 82. According to embodiments, a combination of open and covered/filled radiopaque widened portions 78, and sub-struts 82 bearing radiopaque coils, can be employed. The widened portions may also alternate or vary in size from one strut 68 to the next. The struts 68 can be configured to form the sub-struts 82 and opening 84 via tapering portions 86 on either side of the opening 84. Distal and proximal of the tapering portions 86, the struts 68 can be of substantially uniform width. The proximal portion 88 of the strut 68 (proximal of the widened portion 78) can be wider than the distal portion 90 of the strut 68 (distal of the widened portion 78). In such a case, the width of the proximal strut portion 88 can nonetheless be substantially uniform from the proximal tapering portion 86 to the intermediate portion 54, and the width of the distal strut portion 90 can be substantially uniform (but narrower than the width of the proximal strut portion 88) from the distal tapering portion 86 to the distal tip portion 70 of the device 50. 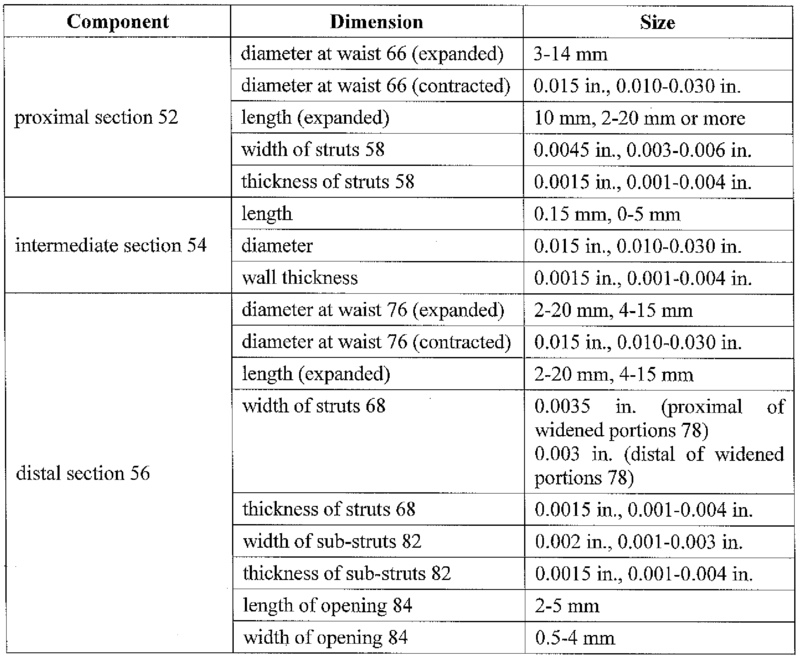 By employing struts 68 that are narrower in their distal portions 90 than in their proximal portions 88, the distal face of the distal portion 56 can be made relatively compliant and therefore more easily conformable to any embolic material in the aneurysm 20, while retaining a desired degree of stiffness in the proximal components of the device 50. The various versions of the vascular remodeling device 50 disclosed herein (e.g. the devices 50 of Figures 5-12) can be manufactured in a process comprising cutting (or electrochemically etching) and shaping a metallic tube or sheet (e.g., a laser cut hypotube or sheet). A laser or electrochemical etcher may cut out portions of the tube, leaving in place the various structural elements of the proximal section 52, the intennediate section 54, and/or the distal section 56. In the device 50 depicted in Figures 5-9 and 12, or the device 50 depicted in Figures 10-12, the proximal section 52, the intermediate section 54, and the distal section 56 can be integrally formed from a metallic tube and not cut away from each other. In devices 50 in which all sections 52, 54, 56 are integrally fabricated by being cut, etched, etc. from the same tube or sheet, the device 50 is of single-piece construction, taking the form of a single, partial tube or sheet. Alternatively, the sections 52, 54, 56 can be formed separately and then assembled together using any suitable technique, such as welding, gluing, interlocking, crimping, .swaging, braiding, deposition, etc. Where the intermediate section 54 comprises a coil, the sections 52 and 56 may be formed from the same or separate tubes, and then attached to either end of the coil using any such suitable technique. After cutting from one or more tubes, the device 50 or section(s) 52/54/56 thereof may be reshaped and heat treated to impart shape setting to the device or section(s). The shape setting process may include several steps comprising, for example, stretching and confining the cut tube into a new shape during the heat treatment. At the end of each heat treatment step, the cut tube assumes the shape in which it was confined during the heat treatment process. The final shape (e.g., expanded state) and size may obtained by several such steps. The device 50 or cut tube may be electropolished during manufacture, which can reduce the initial wall thickness of the tube to a final, desired thickness. Although the device 50 is depicted in its expanded state in Figures 5-1 1, the device 50 can have a contracted state in which the proximal and distal sections 52, 56 take on a smaller diameter than in the expanded state. For example, in the contracted state the sections 52, 56 can have a diameter small enough to fit within a delivery device, such as a microcatheter. Where the sections 52, 54, 56 are cut from a single tube, the diameter of one or both of the proximal and distal sections 52, 56 when in the contracted state can be substantially equal to the diameter of the tube from which the device 50 is cut, and/or substantially equal to the diameter of the intermediate section 54. The table below provides an example set of dimensions that can be employed in constructing the device 50 of Figures 5-9 and 12. Such a device 50 can have a proximal section 52 with six struts 58, and a distal section 56 with eight struts 68. The table below also provides an example set of dimensions for all components of the device 50 of Figures 10-12 that are common with the device 50 of Figures 5-9 and 12. The dimensions provided below should not be taken as limiting with respect to the device 50 of Figures 5-9 and 12 or the device 50 of Figures 10-12. One, several, or all of these dimensions can be disregarded when constructing the device 50 of Figures 5-9 and 12 or the device 50 of Figures 10-12. Figures 13-15 depict an example of a cut pattern 100 that can be employed (e.g., in laser cutting or etching a hypotube or sheet) to construct the device 50 of Figures 5-9 and 12. The cut pattern 100 of Figures 13-15 is suitable for a device 50 having six struts 68 in the distal portion 56; otherwise, the device 50 formed via the cut pattern 100 can be similar in structure, function and method of use to the device 50 depicted in Figures 5-9 and 12 and described elsewhere herein. The cut pattern 100 provides uncut areas that form the various components of the device 50. Those components of the device 50 are marked in Figures 13- 15 with the same reference numerals as in Figures 5-9 and 12 (and, for common components, as in Figures 10-11). Figures 16-18 depict another example of a cut pattern 200 that can be employed (e.g., in laser cutting or etching a hypotube or sheet) to construct the device 50 of Figures 5-9 and 12. The cut pattern 200 of Figures 16-18 is suitable for a device 50 having four struts 58 in the proximal portion 52 and four struts 68 in the distal portion 56. The cut pattern 200 also forms widened portions 78 whose longitudinal midpoints are on the waist 66 of the distal portion 56, rather than on the distal face 74 thereof. Otherwise, the device 50 formed via the cut pattern 200 can be similar in structure, function and method of use to the device 50 depicted in Figures 5-9 and 12 and described elsewhere herein. The cut pattern 200 provides uncut areas that form the various components of the device 50. Those components of the device 50 are marked in Figures 16-18 with the same reference numerals as in Figures 5-9 and 12 (and, for common components, as in Figures 10-11). Figures 8, 9 and 11 illustrate examples of the placement of the device 50 at a bifurcation 25. The proximal section 52 is anchored in the afferent or parent vessel 30, the intermediate section 54 allows perfusion to the branch or efferent vessels 32, 34, and the distal section 56 acts as scaffolding to inhibit herniation of embolic material from the aneurysm 20, and/or to induce thrombogenesis in the aneurysm 20. Positioning of the device 50 using the parent vessel 30 as the delivery path for the device 50 may be accomplished via, for example, the method illustrated in Figures 19-21. First, as shown in Figure 19, a delivery catheter 300 (e.g., a micro catheter or other catheters that can be tracked through and reach the location of the aneurysm 20) is inserted into the patient's vasculature and advanced distally through the parent vessel 30 until a distal tip 302 of the catheter 300 is placed in the junction 36, or in the parent vessel 30 proximal of but near the junction 36, or in the aneurysm 22. The device 50 is then is inserted in the proximal end of the catheter 300 (or it may be positioned in the catheter 300 prior to placement of the distal tip 302). As seen in Figure 20, the distal section 56 of the device 50 is then pushed out of the distal end of the catheter 300 (e.g., using a push wire and pulling the catheter back), allowing the distal section 56 to expand (e.g., self-expand). While the proximal section 52 remains at least partially contracted within the catheter 300 as shown in Figure 20, the position of the expanded distal section 56 relative to the junction 36, aneurysm neck 24 and parent vessel 30 can be adjusted via manipulation of the catheter 300 (and/or push wire, etc.). One example of a desired placement of the distal section 56 is depicted in Figure 20, in which the distal face 74 of the distal section 56 spans the aneurysm neck 24 and/or reduces the effective size of the neck. Such spanning and/or reduction can involve positioning the distal section 56 such that the distal face 74 projects into the neck 24, as depicted in Figure 20. The placement of the distal section 56 can also involve causing the expanded waist 76 to engage the inner wall of the junction 36. Such engagement of the waist 76 (and/or other portions of the distal section 56) with the inner wall of the junction 36 can establish and/or maintain both the longitudinal (proximal-distal) and lateral (transverse to the longitudinal direction) position of the distal section 56 relative to the aneurysm neck 24. To achieve a desired degree of engagement of the distal section 56 with the junction 36, the presently described method can include determining the size, width or diameter of the junction 36, and selecting a device 50 whose distal section 56 has an unconstrained expanded size, width or diameter (e.g. at the waist 76 thereof) which is larger than that of the junction 36. Preferably, the selected distal section 56 is somewhat larger than the junction 36, for example by about 0.5-1.0 mm. When the distal section 56 is positioned in the junction 36 as shown in Figure 20, the inward-tapering, minimally occlusive struts 68 of the proximal face 72 can allow blood to flow with minimal or no obstruction from the parent vessel 30 to the branch vessels 32, 34, either through the proximal face 72 (arrow 79) or around the proximal face 72 (arrow 80). At the same time, the relatively highly occlusive distal face 74 can span the neck 24 and/or reduce the effective size of the neck. The deployment of the device 50 can further proceed with additional proximal withdrawal of the catheter 300 (and/or distal pushing of the device 50) so that the intermediate section 54 emerges from the catheter 300, followed by the proximal section 52, which is allowed to expand (e.g. self-expand). In this manner, the waist 66 can engage the inner wall of the parent vessel 30 as shown in Figure 21, and the proximal section 52 can secure the position of the device 50, particularly against longitudinal movement. Additionally, the extension of the proximal section 52 into the parent vessel 30 can prevent rotation of the distal section 56 in the junction 36 (or, where applicable, the neck 24 or aneurysm 20), and help maintain the waist 76 in engagement with the inner wall of the junction (or neck, or aneurysm). Where the parent vessel 0 is angled or curved with respect to the efferent vessels 32, 34 or the aneurysm 20 (see, e.g. Figure 9), the presently described method can involve tilting, flexing or pivoting the distal section 56 relative to the proximal section 52 (or vice versa), e.g. as the device 50 is advanced into position, and/or adjusted in position or orientation once advanced and deployed or partially deployed. Where the blood vessel has a bend, the device may be a maneuvered around the bend allowing the distal section and the proximal section to pivot relative to each other at or near the intermediate section. The device 50 can be left in its tilted/flexed/pivoted configuration following deployment, as depicted in Figure 9. When the device 50 is deployed in such angled or curved vasculature, portions of the proximal section 52 other than the waist 66 may engage the inner wall of the parent vessel 30, depending on the degree to which the sections 52, 56 are tilted with respect to each other. For example, the proximal and/or distal faces 62, 64 of the proximal section 52 may engage the inner wall of the parent vessel 30. The proximal section 52 can be tilted within the parent vessel 30 such that one side of the proximal face 62 and the opposite side of the distal face 64 both engage the inner wall of the vessel. In addition, the intermediate section 54 may engage or contact the vessel wall as well. Where a suitable proximal end portion 60 and deployment apparatus are employed, the device 50 can be fully retrieved inside the catheter 300, the position of the catheter 300 can be adjusted, and the device 50 can be redeployed, for example to a more desirable position if the position of any section 52, 54, 56 after initial deployment of the device 50 was not as desired after initial deployment. Additionally or alternatively, the device 50 can be fully retrieved inside the catheter 300 and a different catheter or the same catheter 300 with a different device 50 (e.g., a device 50 having different dimensions such as diameter of the proximal portion 52, length of the intermediate portion 54, etc.) can be deployed, for example at a more desirable position or with more desirable properties (e.g., better anchoring, better neck coverage, etc.). Once the device 50 is positioned, the device 50 can be detached from the catheter 300, pusher wire, etc. electro lytically, mechanically, or chemically, and the catheter 300 withdrawn (see Figure 21). The catheter 300 may then be withdrawn from the bifurcation 25, thereby leaving or permanently positioning the device 50 at the junction 36 of the bifurcation 25. Embolic material may be placed in the aneurysm 20 before, after, and/or during positioning of the device 50. Figures 22-24 depict placement of embolic material (in particular, embolic coil(s)) after placement of the device 50. A catheter, which can comprise the catheter 300 or a separate catheter 310 as shown in Figure 22, is advanced distally through the parent vessel 30 and the proximal and distal sections 52, 56 of the device 50 until a distal tip 312 thereof passes through and is positioned distal of the distal section 56, in the fundus 22. As seen in Figure 23, one or more coils 320 (and/or other aneurysm filling material) can then be advanced distally through the catheter 310 and into the fundus 22. Sufficient coils 320 and/or other material can be so delivered into the fundus 22 to create a mass 330 of filling material in the fundus (Figure 24). The device 50, in particular the distal face 74 of the distal section 56, can act as a scaffolding to support the mass 330 in the aneurysm 20 and prevent herniation of coils or other material through the neck 24. Figures 25-32 depict a version of the device 50 (and a cut pattern 300 for constructing it) that can be similar to any of the other versions or embodiments of the device 50 disclosed or summarized herein, in structure, configuration, function, method of manufacture, method of use, and material choice, except as further discussed herein. In the device 50 of Figures 25-32, the struts 58 of the proximal section 52 comprise a number (e.g. 6, as depicted, or any other suitable number) of proximal strut portions 58a and a corresponding number of distal strut portions 58b. The proximal portions 58a and the distal portions 58b are rotated or shifted laterally with respect to each other, such that each proximal portion 58a opposes (e.g., approximately one-half of each of) two distal portions 58b, and vice versa. From the distal end of each proximal portion 58 a, two sub-struts 58c extend distally to the two distal portions 58b that oppose (e.g., are longitudinally, radially, and/or angularly adjacent) the proximal portion 58a from which the sub-struts 58c extend. Accordingly, each proximal portion 58a is connected to the two adjacent or opposing distal portions 58b (and vice versa) via sub-struts 58c. For example, each strut may have a proximal end, a distal end, and a center portion therebetween, the center portion connected to adjacent struts. As used herein, elements that are "longitudinally adjacent" or "longitudinally offset" have a different longitudinal position with respect to an axis. As used herein, elements that are "radially adjacent" or "radially offset" have a different radial distance from an axis. For example, under a polar coordinate system, two members being radially offset would have distinct radial coordinates with respect to an axis. As used herein, elements that are "angularly adjacent" or "angularly offset" have a different angular position with respect to an axis. For example, under a polar coordinate system, two members being angularly offset would have distinct angular coordinates with respect to an axis. In another example, each strut may extend from an origination junction and be divided into a first and second branch, wherein the first branch is connected to a first adjacent strut and the second branch is connected to a second adjacent strut. In this example, a length of the first branch and a length of the second branch may be different such that a connecting point between the strut and the first adjacent strut is disposed at a different longitudinal position than a connecting point between the strut and the second adjacent strut. According to embodiments, the length of the first branch and the length of the second branch may be the same. According to embodiments, the length of the first branch and the length of the second branch may different. For example, one branch may have a different longitudinal position relative to another branch. By further example, one branch may be offset relative to another branch with a different longitudinal position when connected to an adjacent strut. In another example, at least one strut may extend proximally from the intermediate section and be divided into a first and second branch at or near the waist of the proximal section. The first branch may be connected to the first adjacent strut and the second branch may be connected to the second adjacent strut. The first and second adj cent struts may extend proximally from the waist of the proximal section toward the radially central region of the device. According to embodiments, one or more sections 52, 56 may have a first plurality of struts extending from a proximal end of the section and a second plurality of struts extending from the distal end of the section. The first and second plurality of struts may be interconnected at the waist or middle portion of the section by a third plurality of struts. Each of the first plurality of struts may be connected to two or more of the third plurality of struts. Each of the second plurality of struts may be connected to two or more of the third plurality of struts. The number of the first plurality of struts may equal the number of the second plurality of struts. The number of the third plurality of struts may be double, triple, or another multiple of one or each of the number of the first plurality of struts and the number of the second plurality of struts. When the proximal section 52 of the device 50 of Figures 25-32 is expanded, the sub-struts 58c extend both longitudinally to interconnect the proximal end portion 60 and the intermediate section 54, and laterally or circumferentially to each neighboring proximal or distal portion 58a or 58b. The resulting lateral or circumferential interconnection of the struts 58 of the proximal section 52 increases the outward radial force exerted by the proximal section 52 (and the inward radial force that the proximal section 52 can withstand without collapse) when expanded and thereby improves the ability of the proximal portion 52 to "grip" the vessel wall (e.g. of the parent vessel 30) and prevent migration of the deployed device 50 along the vessel lumen. In addition, the lateral/circumferential interconnection of the struts of the proximal section 52 reduces the tendency of the expanded struts 58 to bunch together in the vessel or "half-moon." Further, the lateral/circumferential interconnection of the struts of the proximal section maintains the three dimensional shape of the proximal section. Moreover, the lateral/circumferential interconnection of the struts of the proximal section provides structural support for the interconnected struts. As depicted in Figures 25-26 and 28-29, the sub-struts 58c (e.g., the peaks thereof) can form the waist 66 of the proximal portion 52, or otherwise comprise the radially outermost portion of the proximal portion 52. The sub-struts 58c can optionally be approximately longitudinally centered on the longitudinal midpoint of the proximal portion 52, such that the midpoint approximately evenly divides the sub-struts 58c in the longitudinal direction. Such an arrangement is also depicted in Figures 25-26 and 28-29. As depicted in Figures 27 and 31-32, the widened portions 78 on the distal face 74 of the distal portion 56 can be formed via the later al/circumferential interconnection arrangement employed in the proximal section 52 and discussed above. To accomplish this, the proximal strut portions 88 and distal strut portions 90 of the distal struts 68 are rotated or shifted laterally with respect to each other, such that each proximal portion 88 opposes (e.g., approximately one-half of each of) two distal portions 90, and vice versa. From the distal end of each proximal portion 88, two sub-struts 82 extend distally to the two distal portions 88 that oppose (e.g., are longitudinally, radially, and/or angularly adjacent) the proximal portion 88 from which the sub-struts 82 extend. Accordingly, each proximal portion 88 is connected to the two adjacent or opposing distal portions 90 (and vice versa) via sub-struts 82. For example, at least one strut may extend distally from the intermediate section and be divided into a first and second branch at or near the waist of the distal section. The first branch may be connected to the first adjacent strut and the second branch may be connected to the second adjacent strut. The first and second adjacent struts may extend distally from the waist of the distal section toward the radially central region of the device. When the distal section 56 of the device 50 of Figures 25-32 is expanded, the sub-struts 82 extend both longitudinally to interconnect the intermediate section 54 and the distal end portion 70, and laterally or c cumferentially to each neighboring proximal or distal strut portion 88 or 90. Thus is formed the widened portions 78 having openings 84, in a configuration that increases the outward radial force exerted by the distal section 56 and its ability to grip the inner wall of a vessel, e.g. at the junction 36. In addition, the lateral/circumferential interconnection of the struts 68 of the distal section 56 reduces the tendency of the expanded struts 68 to bunch together in the vessel or "half-moon." Further, the lateral/circumferential interconnection of the struts of the distal section maintains the three dimensional shape of the distal section. Moreover, the lateral/circumferential interconnection of the struts of the distal section provides structural support for the interconnected struts. As depicted in Figures 25, 27 and 31-32, the widened portions 78 and the sub-struts 82 can be located on the distal face 74 of the distal portion 56. The widened portions 78 and sub-struts 82 can optionally be located wholly distal of the waist 76 of the distal portion 56. Such an arrangement is also depicted in Figures 25-26 and 28-29. In other aspects, the widened portions may resemble the structures as disclosed elsewhere herein. The device 50 of Figures 25-32 can be employed in performing any of the methods disclosed herein, e.g. any of the disclosed methods for treating aneurysms or blood vessels such as those depicted and described with reference to Figures 8-9 or 19-24. The device 50 of Figures 25-32 can be deployed in vasculature, e.g. at a bifurcation, in the manner depicted in Figures 8, 9 or 19-24. The features, components, materials or properties of the device 50 of Figures 25-32 can be combined with any of the features, components, materials or properties of any of the other versions or embodiments of the device 50 depicted, described or summarized herein. The configuration of one or both of the proximal and distal sections 52, 56 of the device 50 of Figures 25-32 can be employed when constructing the proximal and/or distal sections of any of the other versions or embodiments of the device 50 depicted, described, or summarized herein. Figures 33-37 depict a version of the device 50 (and a cut pattern 400 for constructing it) that can be similar to any of the other versions or embodiments of the device 50 disclosed or summarized herein, in structure, configuration, function, method of manufacture, method of use, and material choice, except as further discussed herein. The device 50 of Figures 33-37 can be a variation of the device 50 of Figures 25-32, in which the strut pattern employed to form the widened portions 78 on the distal face 74 of the distal portion 56, is also employed on the proximal face 72 of the distal portion 56. Accordingly, in the device 50 of Figures 33-37, the distal portion 56 can comprise a proximal face 72 having a laterally-/circumferentially-interconnecting strut pattern as described above with respect to Figures 25-32. The struts of the proximal face 72 comprise a number (e.g. 6, as depicted, or any other suitable number) of first proximal strut portions 188 and a corresponding number of first distal strut portions 190. The first proximal strut portions 188 and the first distal strut portions 190 are rotated or shifted laterally with respect to each other, such that each first proximal strut portion 188 opposes (e.g., approximately one-half of each of) two first distal strut portions 190, and vice versa. From the distal end of each first proximal strut portion 188, two first sub-struts 182 extend distally to the two first distal strut portions 190 that oppose (e.g., are longitudinally, radially, and/or angularly adjacent) the first proximal strut portion 188 from which the sub-struts 182 extend. Accordingly, each fust proximal strut portion 188 is connected to the two adjacent or opposing first distal strut portions 190 (and vice versa) via sub-struts 182. The number of first distal strut portions 190 may be equal to the number of first proximal strut portions 188. Accordingly, the number of first sub-struts 182 may be double the number of first distal strut portions 190 or the number of first proximal strut portions 188. According to some embodiments, any given pair of one of the first proximal strut portions 188 and one of the first distal strut portions 190 is connected to each other by a single sub-strut 182. According to some embodiments, no pair of first sub-struts 182 extending from the same first proximal strut portion 188 connects to the same first distal strut portion 190. Conversely, each of a given pair of first sub-struts 182 extending from a given first proximal strut portion 188 connects to a different first distal strut portion 190. The distal portion 56 can further comprise a distal face 74 having an identical (as depicted) or substantially similar laterally-/circumferentially-interconnecting strut pattern as described above for the proximal face. The struts of the distal face 74 comprise a number (e.g. 6, as depicted, or any other suitable number) of second proximal strut portions 288 and a corresponding number of second distal strut portions 290. The second proximal strut portions 288 and the second distal strut portions 290 are rotated or shifted laterally with respect to each other, such that each second proximal strut portion 288 opposes (e.g., approximately one-half of each of) two second distal strut portions 290, and vice versa. From the distal end of each second proximal stmt portion 288, two sub-struts distal 282 extend distally to the two second distal strut portions 290 that oppose (e.g., are longitudinally, radially, and/or angularly adjacent) the second proximal strut portion 288 from which the sub-struts 282 extend. Accordingly, each second proximal strut portion 288 is connected to the two adjacent or opposing second distal strut portions 290 (and vice versa) via sub-struts 282. The number of second distal strut portions 290 may be equal to the number of second proximal strut portions 288. Accordingly, the number of second sub-struts 282 may be double the number of second distal strut portions 290 or the number of second proximal strut portions 288. According to some embodiments, the number of second distal strut portions 290 or the number of second proximal strut portions 288 may be equal to the number of first distal strut portions 190 or the number of first proximal strut portions 188. There may be provided the same number of second distal strut portions 290, second proximal strut portions 288, first distal strut portions 190, first proximal strut portions 188, and waist struts 92. According to some embodiments, any given pair of one of the second proximal strut portions 288 and one of the second distal strut portions 290 is connected to each other by a single sub-strut 282. According to some embodiments, no pair of second sub-struts 282 extending from the same second proximal strut portion 188 connects to the same second distal strut portion 290. Conversely, each of a given pair of second sub-struts 282 extending from a given second proximal strut portion 288 connects to a different second distal strut portion 290. The struts of the proximal face 72 and the struts of the distal face 74 are interconnected by a number of waist struts 92, the number of which may correspond to the number of first distal strut portions 190 (or to half the number of proximal-face sub- struts 182) and/or the number of second proximal strut portions 288 (or to half the number of distal-face sub-struts 282). The waist struts 92 form the waist 76 between the proximal face 72 and the distal face 74. Accordingly, the distal portion 56 can comprise two laterally- /circumferentially-interconnecting strut patterns as shown in Figures 33-34, disposed on either side of a relatively radially wide (or the widest) region of the distal portion 56. In contrast, a relatively radially narrow (or the narrowest) region of the device 50 (the intermediate portion 54) is disposed between the laterally-/circumferentially-inter connecting strut pattern of the proximal portion 52, and that of the proximal face 72 of the distal portion 56. The proximal portion 52 of the device 50 of Figures 33-37 can be identical or substantially similar to the proximal portion 52 of the device 50 of Figures 25-32, or of any other embodiment of the device 50 disclosed herein. For example, in the device 50 of Figures 33-37, the struts 58 of the proximal section 52 comprise a number (e.g. 6, as depicted, or any other suitable number) of proximal strut portions 58a and a corresponding number of distal strut portions 58b. The proximal portions 58a and the distal portions 58b are rotated or shifted laterally with respect to each other, such that each proximal portion 58a opposes (e.g., approximately one-half of each of) two distal portions 58b, and vice versa. From the distal end of each proximal portion 58a, two sub-struts 58c extend distally to the two distal portions 58b that oppose (e.g., . are longitudinally, radially, and/or angularly adjacent) the proximal portion 58a from which the sub-struts 58c extend. Accordingly, each proximal portion 58a is connected to the two adjacent or opposing distal portions 58b (and vice versa) via sub-struts 58c. The device 50 of Figures 33-37 can be employed in performing any of the methods disclosed herein, e.g. any of the disclosed methods for treating aneurysms or blood vessels such as those depicted and described with reference to Figures 8-9 or 19-24. The device 50 of Figures 33-37 can be deployed in vasculature, e.g. at a bifurcation, in the manner depicted in Figures 8, 9 or 19-24. The features, components, materials or properties of the device 50 of Figures 33-37 can be combined with any of the features, components, materials or properties of any of the other versions or embodiments of the device 50 depicted, described or summarized herein. The configuration of one or both of the proximal and distal sections 52, 56 of the device 50 of Figures 33-37 can be employed when constructing the proximal and/or distal sections of any of the other versions or embodiments of the device 50 depicted, described or summarized herein. Instead of or in addition to the placement of the mass 330 in the aneurysm 20, the device 50 can be configured as a flow diverter by making the distal face 74 of the distal section 56 sufficiently occlusive to inhibit blood flow out of the fundus 22 and promote formation of thrombus therein. In methods in which embolic material was previously inserted in an aneurysm but has herniated, the device 50 can be used as a "rescue device" to push the herniated material back into the aneurysm and to act as a scaffolding to inhibit or prevent further herniation or prolapse of the embolic material. In certain such methods, deployment of the device 50 may advantageously avoid traversal of the junction comprising the herniated material by wires or a catheter, which may cause the herniated material to become tangled and/or dislodged and which may cause rupture of the aneurysm. According to embodiments, a device 50 may be used to act upon a thrombus of foreign body within a blood vessel. For example, the device 50 may be used for thrombectomy procedures to remove at least a portion of a thrombus from a blood vessel. According to embodiments, the device 50 comprises any number of sections having structure similar to distal section 56, as disclosed herein. For example, the device 50 may comprise proximal section 52, distal section 56, and any number of additional sections proximal to, between or distal to proximal section 52 and distal section 56. For example, the device 50 may comprise one, two, three, four, five, six, seven, eight, nine, ten, or more sections, each having structural configurations according to the present disclosure. According to embodiments, the device 50 comprises a wire tethered to a proximalmost section thereof. According to embodiments, while in a collapsed state within a catheter, the device 50 is positioned at or near a thrombus which resides within a vasculature. From the catheter, the device 50 achieves a deployed or partially-deployed state within the blood vessel. At least one section of the device 50 (e.g., distal section 56) is positioned distal to the thrombus. A distal or proximal motion of the vascular intervention device 50 is generally initiated by a user who can controllably operate the device 50 at the proximal end and may be accomplished by any number of means, for example, proximal motion of the catheter, distal motion of the device 50, or both. The device 50 is movable proximally back into the catheter through a distal opening thereof after engaging the thrombus. The proximal motion of the device 50 effectively retrieves the thrombus into the catheter. The proximal movement also causes the expanded segment(s) to revert back to a collapsed state. Suction, aspiration, or negative pressure may be provided, to facilitate capture of the thrombus within the catheter. Further, balloon devices, such as balloon catheters, may be provided and utilized to manage flow through the vasculature at the location of the thrombus. For example, a balloon may be expanded proximal to the thrombus to substantially slow or stop flow downstream to the location of the thrombus. Use of a balloon and aspiration creates a flow path that facilitates capture of the thrombus within the catheter. One of the advantages of multiple segments is that relatively less precision is required during the positioning process since any of the segments can engage the thrombus. Optionally, the relatively distal segments may act as a filter by having, for example, widened portions that increase the occlusiveness of the distal segment. Thus, parts of thrombus that may be broken up during the engagement of the intermediate segment to the thrombus may be filtered downstream by the distal segment. Some embodiments provide a device for retrieving vascular debris in a vasculature comprising: at least two segments radially expandable from a collapsed state to an expanded state, each segment having a waist comprising the radially largest region of the segment and two longitudinal ends; at least one intermediate portion, each intermediate portion comprising a pivot that connects adjacent segments, each pivot having a diameter comprising the radially largest region of the pivot; a sheath that is configured to encase the segments in the compressed state; and a tether that is configured to retract the expanded segment into the outer sheath. Some embodiments provide a device for retrieving vascular debris in a vasculature comprising: at least three segments expandable from a collapsed state to an expanded state, each segment having a waist comprising the radially largest region of the segment and two longitudinal ends; at least two intermediate portion, each intermediate portion comprising a pivot that connects adjacent segments, each pivot having a diameter comprising the radially largest region of the pivot; a sheath that is configured to encase the segments in a compressed state; and a tether that is configured to retract the segments into the sheath. Some embodiments provide a method of retrieving vascular debris from a vasculature comprising: inserting into the vasculature of a patient at least a portion of a sheath comprising a distal opening and encasing at least two or more segments expandable from a collapsed state to an expanded state, each segment having a waist comprising the radially largest region of the segment and two longitudinal ends; releasing at least a portion of a segment outside the distal opening wherein at least a portion of the segment expands to engage the vascular debris; and retrieving the segment and at least a portion of the vascular debris inside the sheath. Incorporated by reference, as if fully set forth herein, are U.S. Pat. App. Ser. No. 13/428,199, filed March 23, 2012, and U.S. Pat. App. Ser. No. 13/428,237, filed March 23, 2012. The foregoing description is provided to enable a person skilled in the art to practice the various configurations described herein. While the subject technology has been particularly described with reference to the various figures and configurations, it should be understood that these are for illustration purposes only and should not be taken as limiting the scope of the subject technology. [0137} There may be many other ways to implement the subject technology. Various functions and elements described herein may be partitioned differently from those shown without departing from the scope of the subject technology. Various modifications to these configurations will be readily apparent to those skilled in the art, and generic principles defined herein may be applied to other configurations. Thus, many changes and modifications may be made to the subject technology, by one having ordinary skill in the art, without departing from the scope of the subject technology. Terms such as "top," "bottom," "front," "rear" and the like as used in this disclosure should be understood as referring to an arbitrary frame of reference, rather than to the ordinary gravitational frame of reference. Thus, a top surface, a bottom surface, a front surface, and a rear surface may extend upwardly, downwardly, diagonally, or horizontally in a gravitational frame of reference. Furthermore^ to the extent that the term "include," "have," or the like is used in the description or the claims, such term is intended to be inclusive in a manner similar to the term "comprise" as "comprise" is interpreted when employed as a transitional word in a claim. While certain aspects and embodiments of the invention have been described, these have been presented by way of example only, and are not intended to limit the scope of the invention, indeed, the novel methods and systems described herein may be embodied in a variety of other forms without departing from the spirit thereof. The accompanying claims and their equivalents are intended to cover such forms or modifications as would fall within the scope and spirit of the invention. Although invention(s) have been disclosed herein in the context of certain embodiments and examples, it will be understood by those skilled in the art that the invention(s) extend beyond the specifically disclosed embodiments to other alternative embodiments and/or uses of the invention(s) and obvious modifications and equivalents thereof. In addition, while several variations of the embodiments of the invention(s) have been shown and described in detail, other modifications, which are within the scope of this disclosure, will be readily apparent to those of skill in the art based upon the present specification and drawings. It is also contemplated that various combinations or subcombinations of the specific features and aspects of the embodiments and examples may be made and still fall within the scope of the present disclosure. It should be understood that various features and aspects of the disclosed embodiments/examples can be combined with, or substituted for, one another in order to form varying modes of the embodiments/examples of the disclosed invention(s). Thus, it is intended that the scope of the invention(s) herein disclosed should not be limited by the particular embodiments/examples described above. 2. The device of claim 1, wherein the number of the first proximal strut portions is equal to the number of the first distal strut portions. 3. The device of claim 1, wherein the number of the first sub-struts is double the number of the first distal strut portions. 4. The device of claim 1 , wherein the number of the second proximal strut portions is equal to the number of the second distal strut portions. 5. The device of claim 1, wherein the number of the second sub-struts is double the number of the second distal strut portions. 6. The device of claim 1, wherein the second waist comprises the radially largest region of the distal section when the distal section is in its expanded state. 7. The device of claim 1, wherein each of the first sub-struts extends between a first proximal strut portion and a first distal strut portion that are angularly offset with respect to each other. 8. The device of claim 1, wherein each of the second sub-struts extends between a second proximal strut portion and a second distal strut portion that are angularly offset with respect to each other. 10. The device of claim 1, wherein the distal face is configured to perform a therapeutic blocking function at the aneurysm, the function comprising at least one of (a) supporting maintenance of a therapeutically effective amount and/or density of at least one filling material and/or device in the aneurysm, (b) promoting thrombogenesis, and (c) diverting flow from the aneurysm. 11. The device of claim 1, wherein the distal section is configured to prevent members of the second waist from moving substantially toward a side of the blood vessel. 13. The device of claim 12, wherein the number of the proximal strut portions is equal to the number of the waist struts. 14. The device of claim 12, wherein the number of the first sub-struts is double the number of the waist struts. 15. The device of claim 12, wherein the number of the waist struts is equal to the number of the distal strut portions. 16. The device of claim 12, wherein the number of the second sub-struts is double the number of the distal strut portions. 17. The device of claim 12, wherein the first waist comprises the radially largest region of the distal section when the distal section is in its expanded state. 18. The device of claim 12, wherein each of the first sub-struts extends between a proximal strut portion and a waist strut that are angularly offset with respect to the longitudinal axis. 19. The device of claim 12, wherein each of the second sub-struts extends between a waist strut and a distal strut portion that are angularly offset with respect to the longitudinal axis. 20. The device of claim 12, wherein the distal section is configured to prevent members of the first waist from moving substantially toward a side of the blood vessel. 21. The device of claim 12, wherein each of the waist struts comprises: (i) a first distal strut portion extending proximally from the first waist and (ii) a second proximal strut portion extending distally from the first waist. 23. The device of claim 22s wherein the intermediate section maintains a substantially constant radial dimension in both the collapsed state and the expanded state. 24. The device of claim 22, wherein each of the first sub-struts extends between a proximal strut portion and a waist strut that are angularly offset with respect to each other. 25. The device of claim 22, wherein each of the second sub-struts extends between a waist strut and a distal strut portion that are angularly offset with respect to each other. 26. The device of claim 22, further comprising a wire tethered to a proximalmost one of the sections.